Ruth writes: We received this press release from Samara Carroll (samaracarroll7@gmail.com). We liked the idea so much we are passing it on to you. 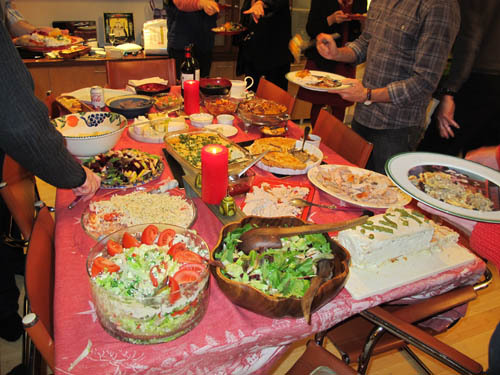 Please let us know if you’ve had experience with Share Thanksgiving. TORONTO, ON – Canadians who are planning their Thanksgiving meals may want to set an extra place this year to welcome newcomer families. Now in its third year, the initiative has now reached across Canada, with signups from Victoria, BC, to Halifax, NS. Last year, Share Thanksgiving connected over 600 families over one-on-one dinners. Friendships were developed and partner families came together again and again to form new traditions throughout the year. “Our belief is that one family-to-family dinner connects us, and 10,000 of these dinners connect Canadians,” says Parker Mitchell, the founder of Share Thanksgiving. Share Thanksgiving is run by a team of volunteers in a dozen Canadian cities. The Toronto team works with settlement agencies from across the GTA, including partnering organization the North York Community House, to safely match up new and host families. Share Thanksgiving is also the recipient of Toronto Community Foundation’s Vital Ideas grant. You can learn more, and sign up, at www.ShareThanksgiving.ca. Sign up will close on October 9th. I’d like to host a family of newcomers at Christmas, but can’t seem to find an organization that handles this. Does anyone happen to know of any? Thanks! Hi Tracey, what a splendid idea. I am currently sending out queries and will let you know if I find anything. Ruth.